Many churches have an annual tradition that they call homecoming. Church members who have moved away to other cities typically will come back to church that Sunday. It's always a lot of fun to reconnect with old friends. We have a Christmas tradition that brings all the family together. We may not see each other during the entire year, but at Christmas, we're laughing and sharing our favorite dish together. 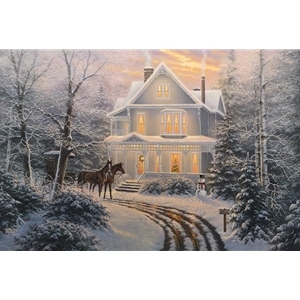 In this painting titled Homecoming, I am envisioning the family getting together to celebrate Christmas and enjoying the warm fire in the fireplace. The setting is the turn of the century with an old Victorian house and a horse drawn carriage parked outside. Come on in and enjoy the warmth of home and the aroma of a fresh baked apple pie.